The eyes are one of the many distinct features on your body that people often notice because they can reflect your emotions, engage in nonverbal communication, and even reveal your age. Many ethnic groups have specific characteristics that make them beautiful and different. No matter their background, it is common for men and women to want to improve their facial appearance with plastic and cosmetic surgery. Certain conditions, such as droopy eyelids or puffiness under the eyes, can add unwanted years to your facial appearance. While some patients want to address these concerns, other patients who lack natural eyelid folds may benefit from undergoing Asian double eyelid surgery. While all blepharoplasty can provide patients with an aesthetically pleasing appearance, different types of blepharoplasty address different concerns. One type of eyelid surgery removes excess skin and bags that have developed around the eyes. This procedure involves creating incisions along the crease of the eyelid to remove any superfluous tissue. In some cases, fat grafting can be used during blepharoplasty to treat volume loss or puffiness around the eyes. It can also be performed with other techniques such as a facelift or brow lift for optimal results. Asian double eyelid surgery, or Asian blepharoplasty, can create natural-looking eyelid creases for patients who lack them. This procedure is commonly performed on patients of Asian descent and is not meant to make their eyes look Caucasian, but it instead creates natural folds that will flatter their face. 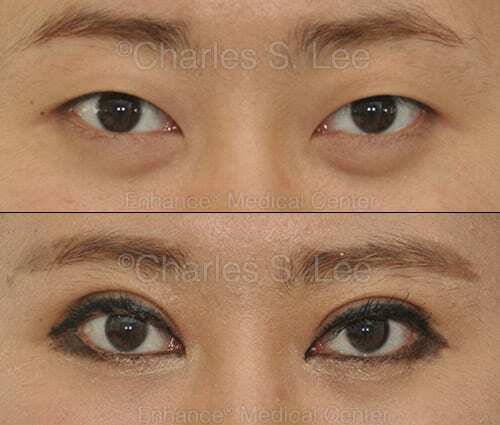 Dr. Lee is careful to maintain his patients’ ethnic qualities whether using the incisional method or the non-incisional double suture and twisting (DST) technique for his Asian double eyelid surgeries. Asian women who choose to undergo this procedure also find it easier to apply makeup to their eyelids. In some cases, Asian double eyelids can be created without making any incisions. Using the Double Suture and Twisting (DST) technique, they are created without cutting the skin, but rather by using sutures, resulting in virtually scarless folds that give the appearance of naturally larger eyes. Even though there is no cutting, this method rarely leads to fold failure. However, if fold failure does occur, Dr. Lee can correct this issue easily. 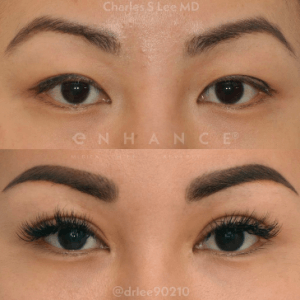 For more information about Asian double eyelid surgery, schedule your consultation with Dr. Charles Lee today. You can call our office at (310) 231-6811.